Senator Susan Collins of Maine. 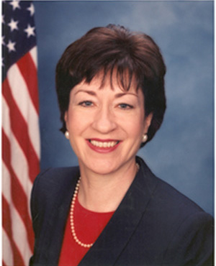 In September, 2004, Sen. Collins introduced a bill called the National Intelligence Reform Act of 2004. It was understandably controversial, and many of the objections to it were of the form here called "road blocking." Sen. Collins attempted to deal with these objections in multiple ways, including a press release you can read for yourself. The challenges of dealing with road blocking in a public arena are much more difficult than what we find in meetings, but the content of effective responses is no different. Read her approach for some valuable guidance. Photo courtesy United States Senate. Most of us hate meetings. Even telephone meetings. Common complaints: endless, irrelevant chatter; boring; nothing to do with me; ego wars; could have been done in email; and on and on. Luckily, many of the irritants are avoidable distractions, if we know what to avoid. Here are some guidelines for identifying avoidable distractions. In this Part I, I'll focus on toxic conflict. In the descriptions below, I'll occasionally use names for the people doing the distracting: Dennis or Denise. When the discussion turns in a direction that could be uncomfortable to Dennis, he might raise a ruckus, display anger, inject irrelevant points, or otherwise distract the group. People then lose the original thread, which prevents the discussion from entering Dennis's discomfort zone. When the discussion seems to be converging on a conclusion that Denise dislikes, she'll often raise issues that are irresolvable at this meeting. She wants to buy time for private lobbying, or to allow alternatives to gather strength. Examples of road blocking: "We need more information," "We should check whether this would be OK with them," or "We should investigate this (cheaper, faster, whatever) alternative for compatibility with Marigold." When Dennis opposes the indicated conclusion of the discussion, instead of criticizing the conclusion, he might criticize the method used to reach the conclusion. Questioning reasoning, assumptions, or data can be legitimate, but he might also attack the process: it was too hurried, it was unfair, the right people weren't involved, and so on. Here the group falls into discussing the human frailties, deficiencies, or motives of anyone not present. Although this might provide some relief to participants, it's politically dangerous and environmentally toxic. Suppose someone describes a historical situation or sequence of events, as a way of informing the group of a potentially risk-generating situation. Denise, perceiving this comment as criticism of her proposal or prior contribution, defends against her own perception. Anticipating potential future blame, at this meeting or in some as yet undetermined venue, Dennis offers information not relevant to the immediate issue, except insofar as it might be self-exculpatory, or possibly deflective onto another party. This tactic is often called "CYA." Slinging mud indirectly, Denise contributes something she believes will degrade the group's opinion of another of its members, without mentioning the target by name. She can therefore claim that her comment wasn't personal. And since understanding the insult requires background information, newer members of the group rarely recognize that anyone has been insulted. Would you like to see your comments posted here? rbrenXtQRUeUkcHyDBcUcner@ChacUHZeHyjYUQkBsSekoCanyon.comSend me your comments by email, or by Web form. I offer email and telephone coaching at both corporate and individual rates. Contact Rick for details at rbrenhfodChGgiTaAQBWTner@ChacHJwjgbJEzUQhRbWJoCanyon.com or (650) 787-6475, or toll-free in the continental US at (866) 378-5470.